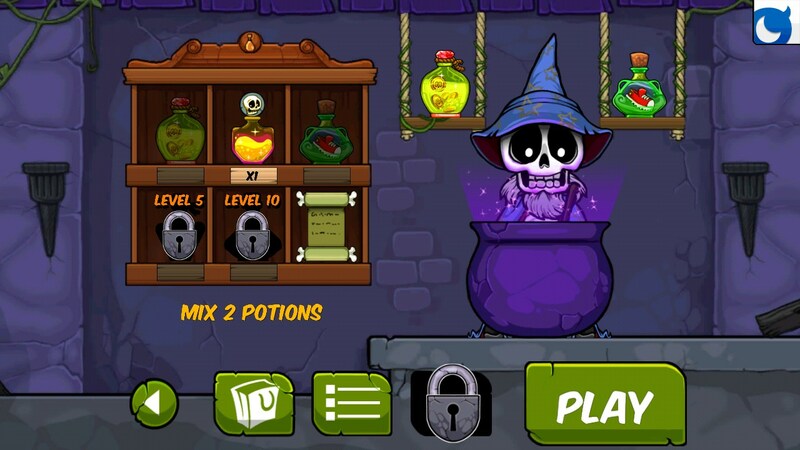 Boney The Runner – Games for Android 2018 – Free download. 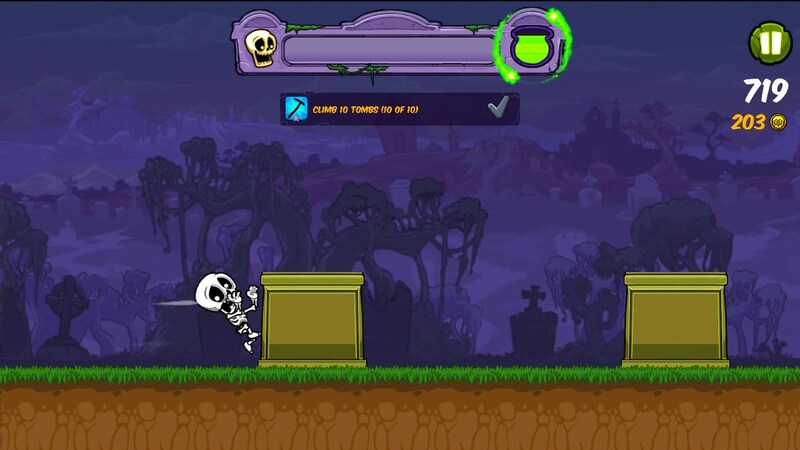 Boney The Runner – We help to escape from the dogs skeleton. Boney The Runner - this is another arcade game in the genre of "Runner" to Android, which we need to help revived skeleton escape the angry dogs. As you know, dogs love to gnaw bones and just can not resist such a temptation. Development of the game has been well-known to us studio Mobage, which we know from the original games, as a simulator of collecting frogs Pocket Frogs and control simulator airline Pocket Planes . This time the studio has moved away from his style and made the most simple and ordinary arcade. The game is made in 2D. We will be running away from the dogs that live on the old deserted cemetery. The task of the game is quite simple - you can run a longer distance and try not to stop. Each length of time the game speed will increase. 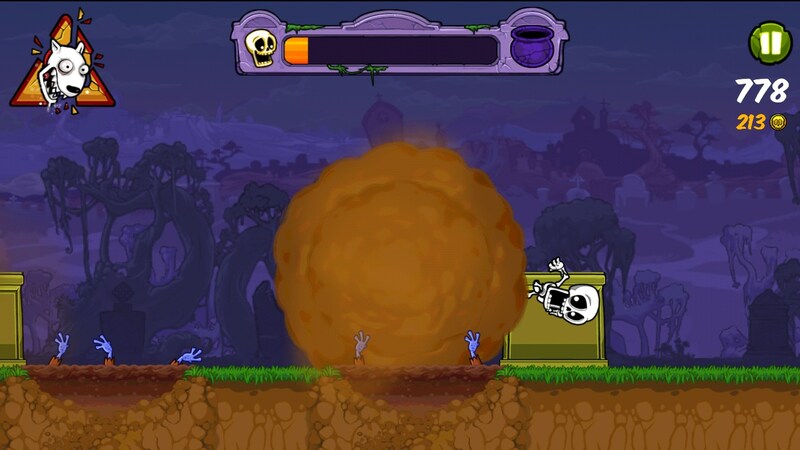 Unlike Boney The Runner from other similar games is that when plunging into the tombstone or any other wall, we did not lose, just a skeleton starts to climb it by hand, spending a lot of time. While running, we can collect different coins, which can then be spent on the purchase of magical cans of amplifiers. Also, when we raise the gold, our skeleton begins to move faster. More on gold received can buy a variety of decorations for the bald head of the skeleton and try on a gladiator helmet or a pirate hat. Do not forget also about the various obstacles that will wait for us on the way, and it's endless tombstones with crypts, as well as zombies and restless ghosts. With each new record will be cheering us after death support group with flags and colorful dresses. It looks action is very, very funny. Changing the appearance of the character. Summary. 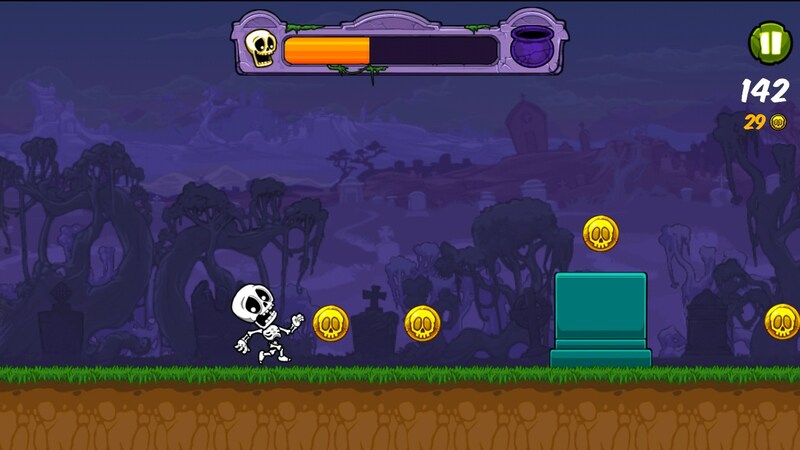 Boney The Runner - is a simple and addictive arcade game for Android, which is ideal to hold a free five minutes while waiting for a happy and positive. There are no stars in the sky game is not enough and does not try to compete with Temple Run 2, but his players will certainly find.